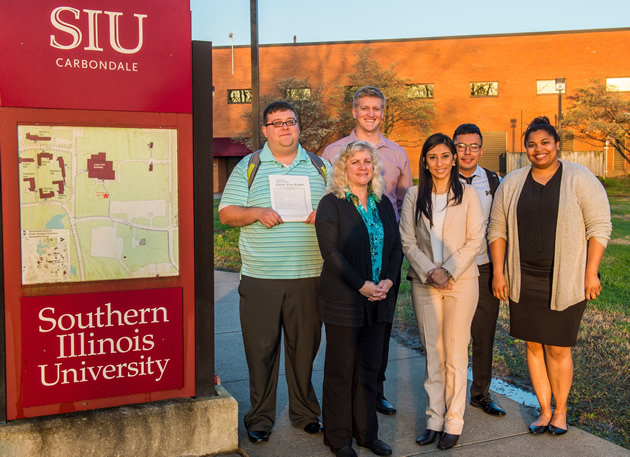 Several times each year, SIU law students have the opportunity to volunteer to visit the Tri‐County Justice & Detention Center in Ullin, IL to meet with the immigration detainees being held there by Immigration and Customs Enforcement, which is part of the U.S. Department of Homeland Security. Students receive some basic training in immigration detention issues prior to each trip. While at Tri‐County, one of the project leaders makes a “Know Your Rights” presentation to the immigration detainees. Written “Know Your Rights” packets which provide basic legal information in several different languages are distributed to the detainees. The law students then conduct individual intake interviews with any interested detainees to assess whether the detainees’ legal needs are being met. This project is coordinated with the National Immigration Justice Center, based in Chicago, which provides follow up legal services for many of the detainees who have meritorious cases. The Project is supported, in part, by a grant the Illinois Equal Justice Foundation. R. is a young man from Guatemala. He used to be a member of a gang in Guatemala, and when he was 15 years old he was tortured by the police due to his gang involvement. After leaving Guatemala he decided to leave the gang. He feared that if returned to Guatemala he would face persecution from the gang for having left the gang or alternately face repeated torture by the police for his gang involvement as they would not recognize that he’d left the gang. After coming into contact with R. through the Know Your Rights program, NIJC was able to accept his case and represent him in his application for protection based relief. He was ultimately granted relief under the Convention Against Torture and released from custody. A. is a 42-year-old man from El Salvador. He is married to a US Citizen and has four US Citizen children. He was granted Lawful Permanent Resident status in the past but became removable due to a theft conviction that had a suspended sentence of several years. Although he only had to serve 90 days in jail, A.’s offense was considered an aggravated felony. After finding A. through the Know Your Rights program, NIJC was able to represent A. in a new application for Adjustment of Status through his citizen wife. Under recent 7th Circuit case law, A. was found eligible to “re-adjust” his status and newly become a Lawful Permanent Resident, despite his conviction, which is considered an aggravated felony under immigration law. The judge considered his lengthy residence in the United States, significant family ties, and otherwise clean criminal record in granting him relief. He was released from custody and reunited with this family.